Measure the ingredients. Shake the bag of flour a little to add some air to it, and then put it in a bowl. If you press on top of it, the weight of the flour will change quite a lot so be careful. 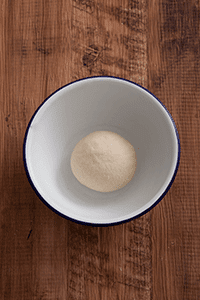 Place granulated sugar,water, milk and dry yeast in a bowl, and mix well. Add the flour and knead a little, then take the mixture out onto a countertop and knead for 5 minutes, just enough for the dough to become smooth. 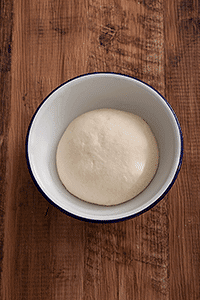 Use a card to scrape around the edges of the bowl and take the whole dough out at once. 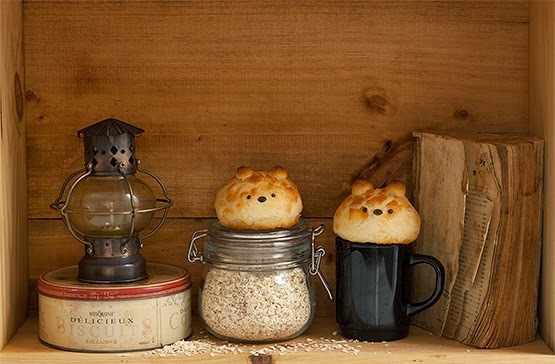 Be careful not to damage the dough when doing this. First of all, divide the dough into 4 equal parts. - 2 pieces of dough of 2 grams(0,1oz) each, for the ears. Lightly flatten the dough and punch it down. Re-roll all of them. Let the dough sit for 15 minutes after placing a fully wrung wet cloth on top. 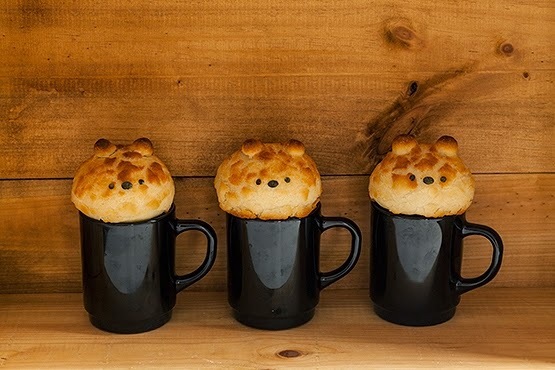 Firmly attach the ear portions (2g/0,1oz × 2) to the large rounded doughs and create a bear shape. 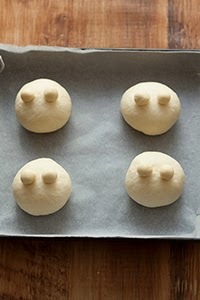 Immediately after shaping the dough into a bear figure, prepare dough for toppings. Pour a tablespoon of lukewarm water into a bowl. 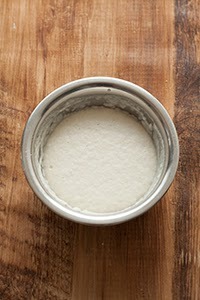 Add granulated sugar, salt, dry yeast and oil to it and churn them well to melt the dry yeast. Put rice flour and bread flour into the bowl and mix the content. 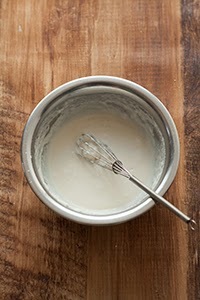 Blend the remaining lukewarm water by adding it little by little (The topping dough should be tacky -- like a pancake dough. A tiger pattern will not emerge if you have added too much water. 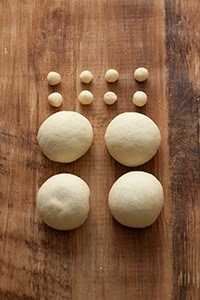 So you should carefully check the state of the dough when adding the water.) 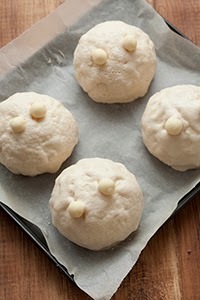 Cover the dough with a plastic wrap and let it undergo secondary fermentation until doubled in size along with the bread dough. Preheat the oven to 410 degrees (210℃ degrees Fahrenheit.). Paste the topping dough over the bread dough. A butter knife or spoon would be useful. Paste it over the dough evenly other than the crust. 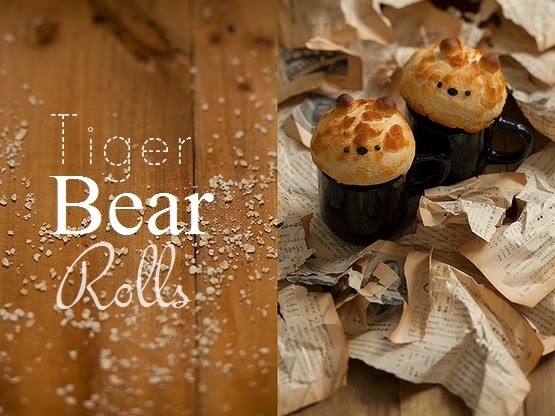 You would not obtain a tiger-pattern surface when the layer is too thin or thick. The thickness of 0.07 to 0.08 inches(2-3mm) is ideal. Bake the dough immediately after finishing the pasting process. Create eyes and noses using toasted nori seaweed.I used a seaweed puncher to make eyes and nose. The seaweed puncher is very convenient, since all you have to do is place the seaweed in it and push to cut out the parts of the face. You can buy it on Amazon Japan. “Komeko (rice flour)” is a collective term and there is a number of types that fall into this category. Different types of rice, such as uruchi-mai (non-glutinous rice) and mocha-gome (glutinous rice), are used for rice flour. And some flour are produced by milling raw rice while others are milled after heating rice. Joshinko, which I have used in this recipe, is a kind of uruchi-mai. It was milled and dried after water absorption process. It is used widely for many kinds of Japanese confectionary including kusamochi and mitarashi-dango. Joshinko is so popular in Japan that you can spot it at almost all supermarkets across the country. But I have no idea about the production method of komeko(rice flour) applied in other countries. Sorry. If you use a rice flour other than Joshinko, please take utmost care for the amount of the lukewarm water as well as yeast. 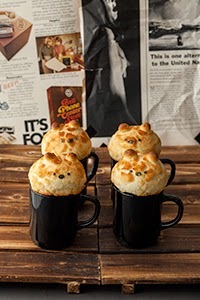 I have made many trials on the production of tiger bread using a lot of different rice flour, and found that the crack patterns are very different depending on the komeko(rice flour) I used. If you use a low oven, lower the baking temperature by around 70F. 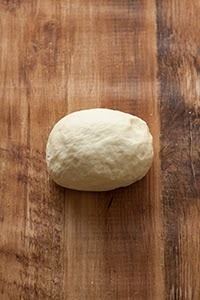 A high temperature would harden the dough surface too soon, leading to little formation of cracks. 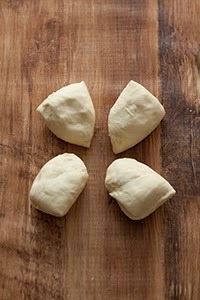 In this recipe, the topping dough starts forming cracks seven to nine minutes after the start of baking. If there are no cracks even after ten minutes have passed, unfortunately, it is probably because of a higher temperature or some problems with the dough.